Argentina has pressed ahead with its threat to sue three UK oil exploration firms operating in British owned waters it claims as its own, according to the country’s Falklands minister. At a press conference in London, Daniel Filmus announced that an Argentine judge would be taking on the case, which will also see legal action extended to a pair of US oil companies. He said Argentina, which claims the South Atlantic archipelago, would use both international and domestic law to pursue the case. 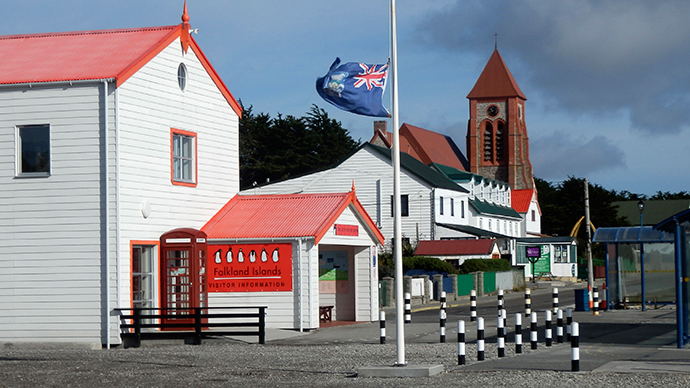 The Falkland Islands Government responded quickly to the legal challenge. “The Falkland Islands Government (FIG) fails to see how drilling is in any way a provocation. “We have the right to develop our economy, including the hydrocarbons industry, and we are exercising that right. Exploration drilling has been happening in Falkland Islands waters for many years. The litigation will center on three UK oil exploration firms: Premier Oil, Falkland Oil and Gas, and Rockhopper. Earlier this month the firms reported they had discovered 27.9 meters of net-oil bearing reservoir and 18.5 meters of net gas-bearing reservoir. The license area being explored – which lies to the north of the Falklands – is 40 percent owned by Falklands Oil and Gas, 36 percent by Premier Oil and 24 percent by Rockhopper Exploration. As the UK general election approaches, Britain has very publicly reinforced its garrison in the contested South Atlantic archipelago over which the two countries fought a short but vicious war 33 years ago this month. The redeployment last month of two Chinook helicopters, withdrawn in 2006, and a pledge by Defence Secretary Michael Fallon to spend £180 million over the next 10 years on upgrading Falkland defenses, both come at a time when advancing UK oil exploration has become a central component of the 182-year-old colonial dispute. Tensions between the countries have waxed and waned in the three decades since Argentine forces were driven out by a British task force, but recent leaks by NSA whistleblower Edward Snowden indicate Britain has waged a secret intelligence war throughout the intervening period. The intelligence data released by Snowden suggests Britain spied on the Argentine authorities since at least 2009, preparing offensive cyber operations to change public opinion regarding the Falklands, according to the Intercept.